Coloured lithograph by Thomas Mann Baynes showing a view from the tunnel over Canterbury showing the cathedral and the rear of the locomotive 'Invicta'. The Invicta was designed for the Canterbury & Whitstable line by Robert Stephenson (1803-1859). Stephenson also designed the 'Rocket' that became famous after winning the Rainhill Trials on the Liverpool & Manchester Railway in 1829. Printed by C Hullmandel and published by Henry Ward, Canterbury. 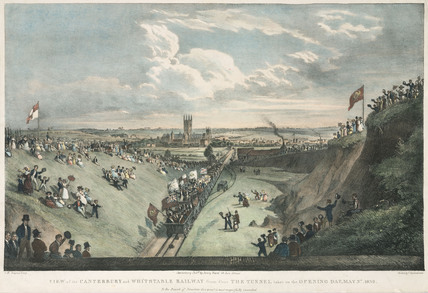 'View of the Canterbury & Whitstable Railway taken on the opening day 1830'.